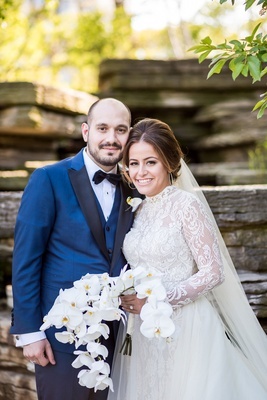 Even though Christina Deveros and Kosta Sarris did not date until 10 years after their first encounter, neither could deny that it was love at first sight. 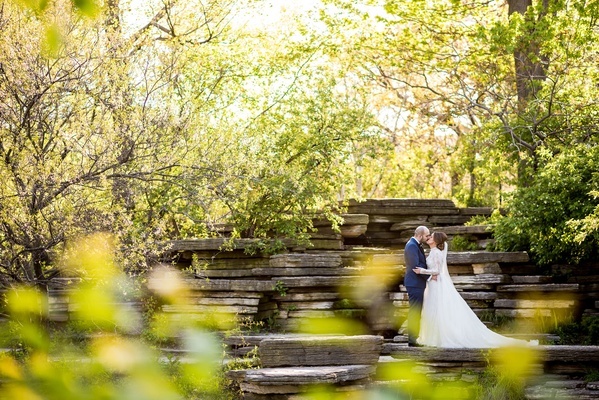 “We both felt an instant connection,” the bride shares. 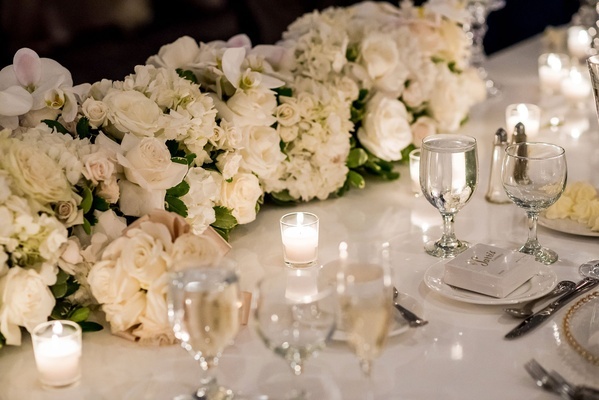 “We were friends for many years before we became a couple [and I] wouldn’t change a thing.” When the time was right, Kosta decided to pop the question at the same Chicago hotel in which the couple shared their first kiss. 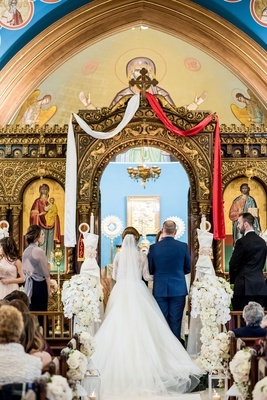 Honoring their Greek heritage, the pair hosted a traditional Greek Orthodox ceremony at Christina’s church, where she was baptized years prior. “St. 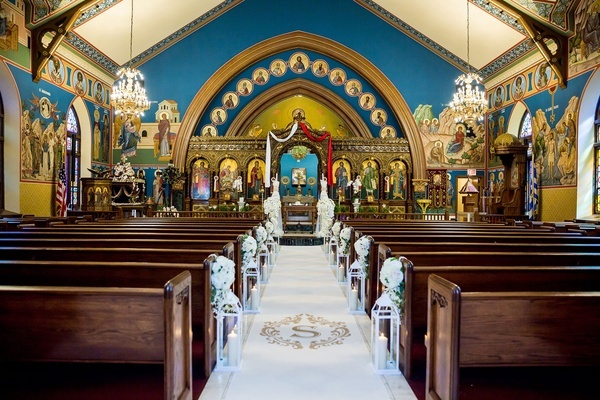 George was the only church I envisioned walking down the aisle at, and it was so special,” she muses. 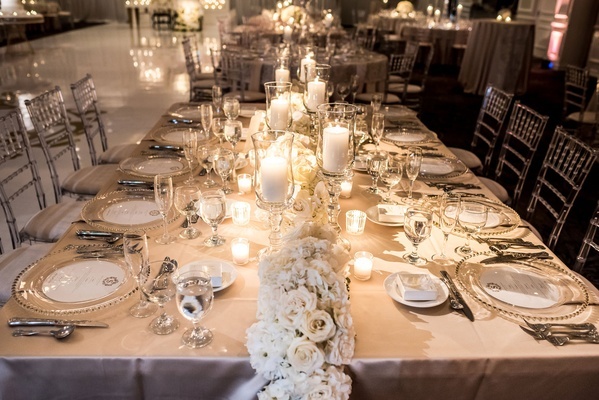 They decided to incorporate their nieces, nephews, and goddaughters in the wedding party as maids of honor, junior bridesmaids, flower girls, and ring bearers. 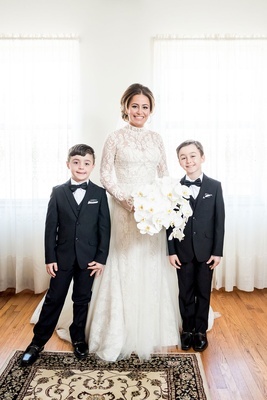 “We have eight nieces and nephews between the both of us, along with three goddaughters, and it was so special to both of us that they were all part of our wedding party,” Christina says. 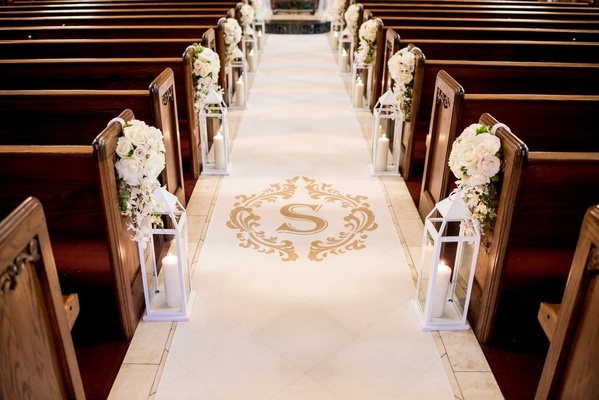 Each member of the wedding party proceeded down the monogrammed aisle runner, which was complemented by the lovely blooms and lanterns lined at each pew. 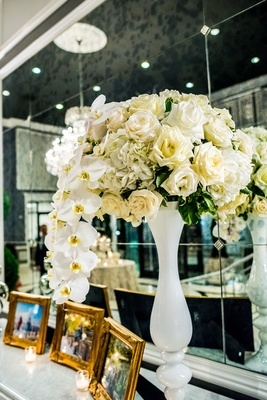 The lovebirds said their "I dos" at the altar adorned with cascading orchids – identical to those in the bridal bouquet. 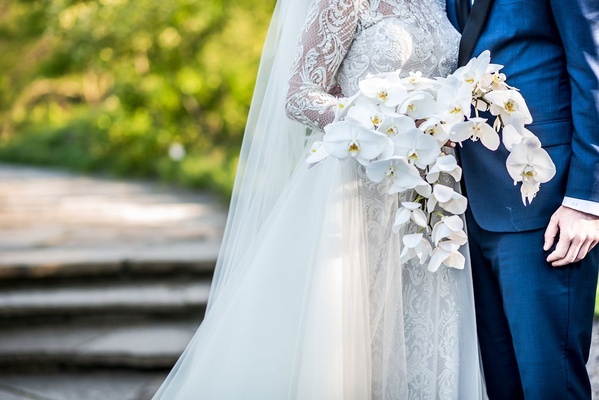 “Flowers were so important and I wanted as many as possible, especially of our theme flower, orchids,” the bride reveals. 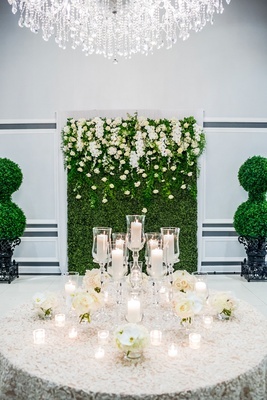 The floral theme and Greek wedding traditions persisted throughout the reception. 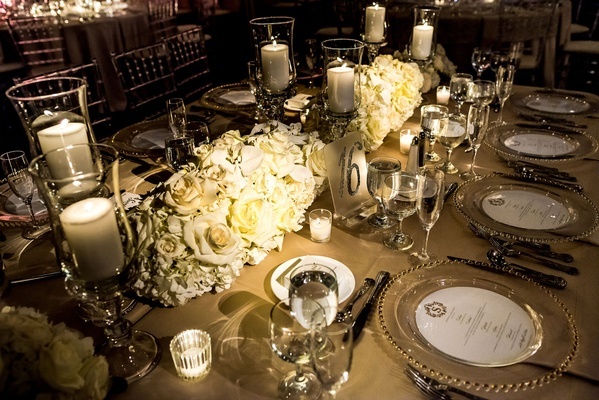 Each table was decorated with gorgeous white blooms that paired perfectly with candlelight. 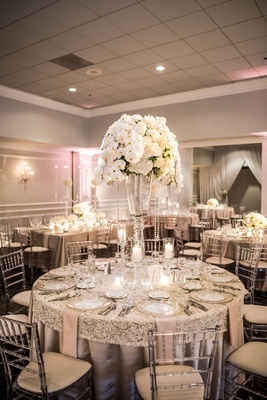 “Our unique custom-built head table backdrop filled with flowers and hanging chandeliers was the focal point, along with a beautiful white table with gold accents and cascading flowers to the floor.” Orchids also cascaded down the wedding cake, which showcased decorative lace matching the bridal gown and a tier resembling the wedding invitation motif. 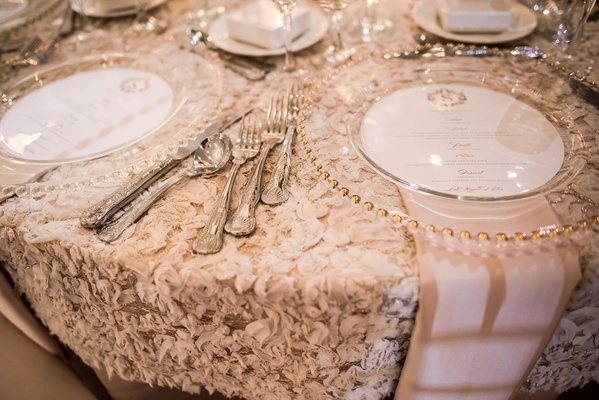 After a fulfilling five-course dinner, the duo shared their first dance to “To Kyma,” a beautiful Greek song. 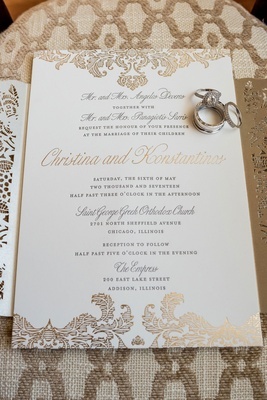 “[We had] tons of Greek food and dancing at the reception, including a traditional Greek band,” Christina remembers. 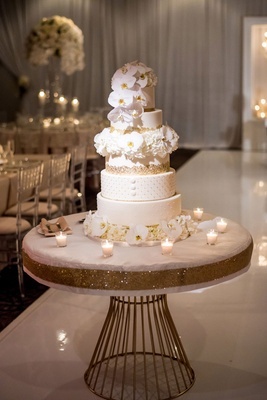 As the night came to an end, attendees took home boxed sweets that showcased the newlyweds’ last name. 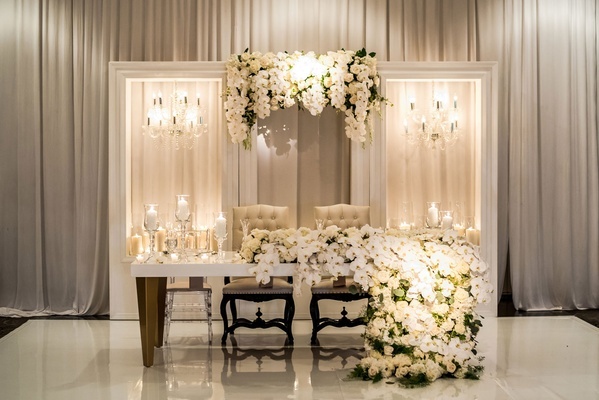 “Our wedding favors consisted of a white box of chocolates by a chocolate company that so happened to be named ‘Sarris,’ our new married name!” exclaims the bride.